Global warming could drive many small animals and plants to extinction, according to the first study to measure the impact of climate change on America's national parks. Researchers found that the average temperatures in national parks increased at twice the rate as the rest of the nation. Unless action is taken to curb greenhouse gas emissions, higher temperatures could virtually eliminate the habitats of small mammals, such as the mountain-dwelling American pika, according to the study, which appears in the journal Environmental Research Letters. 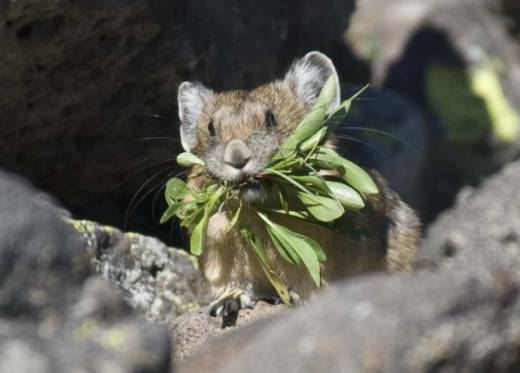 The pika has become a kind of poster critter for climate threats, as it can only survive at high elevations, where temperatures remain cool. "Human-caused emissions [are] shifting warmth up mountains, which could destroy suitable habitats from the tops of these mountains," says Patrick Gonzales, a climate change scientist at UC Berkeley and lead author of the study. "We have more leverage to deal with this now, by reducing greenhouse gas emissions that could harm small mammals." National parks are especially vulnerable to the impacts of climate change because they're often located in regions that are hardest hit by global warming, such as at high elevation or upper latitudes. Researchers found that the average temperatures in national parks increased at twice the rate as the rest of the nation. Parks also experienced a significant decline in annual rainfall compared to the U.S. as a whole, according to the joint study by UC Berkeley and the University of Wisconsin. At the current rate of emissions, temperatures in the most vulnerable parks could soar by as much as 16 degrees Fahrenheit by 2100 -- a rate that gives species little time to adapt or migrate to more suitable climates, if there are any. The findings are "bad news" for biodiversity, according to Rodolfo Dirzo, a biologist at Stanford University, who was not part of the study team. "Since protected areas represent currently one of our best instruments to protect biodiversity, the fact that North American parks are going to experience such drastic changes in their climatic conditions is a critical message," says Dirzo. He notes that many populations of small animals and plants are typically less vulnerable to anthropogenic warming, so the fact that these same populations are expected to experience such formidable challenges demands "immediate, effective action to prevent massive declines of our already threatened biodiversity." Changing climate conditions in our national parks also increases human vulnerability, according to Gonzalez. He points to San Francisco residents' reliance on the Hetch Hetchy reservoir in Yosemite National Park. "It's essential that park officials conserve the watershed so that water is plentiful and clean for human consumption," says Gonzalez. Researchers made their projections using data collected from weather stations located throughout the U.S. that track monthly temperature and rainfall going back to 1895. They created maps of the average annual temperature and rainfall amounts throughout the country, at points approximately 800 meters apart. They then compared the maps to historical temperature and rainfall data. The data revealed that on average, temperatures in national parks increased by nearly 2 degrees Fahrenheit from 1895 to 2010 -- roughly twice the warming experienced by the rest of the country. National parks also saw a 12 percent decline in rainfall compared to 3 percent for the U.S. at large. National parks in Alaska endured the greatest increases, while rainfall decreased the most in Hawaii. Researchers also estimated future changes in temperature and precipitation using four different climate scenarios developed by the United Nations' Intergovernmental Panel on Climate Change. The scenarios include one where no action is taken to reduce emissions, one based on commitments made in the Paris Agreement on climate three years ago, and two that range somewhere in the middle. Under the most extreme climate change scenario, the study found that the collective average temperature of all the national parks could rise between 9 and 13 degrees Fahrenheit. Abiding by the Paris Agreement could limit this rise to between roughly 2 to 6 degrees Fahrenheit. Under both scenarios, projected temperature increases are greatest in Alaska's national parks, while rainfall decreases most in the Virgin Islands and the southwestern U.S. Researchers hope that the maps can aid park officials in developing stronger measures to protect endangered species and park resources from the impacts of climate change. "Our results show that reducing pollution from human resources can save parks from the most extreme heat," says Gonzalez. "Compared to the highest emissions scenario, a scenario of adhering to the Paris Agreement would lower the rate of heating in parks by two-thirds by the end of the century." The findings, he says, only underscore the National Park Service's mandate of protecting parks for future generations. "The data can point parks in the direction of conserving the most vulnerable places or potential refugia, which are stable places that might provide shelter to plant and animal species," he says. "The future of these national parks is in our hands."